So, word to the wise – if you ever place an online order with Omaha Steaks, they will e mail you every day for the rest of your natural life. Yeah, I could opt out of their mass-mailings, but then I’d miss out on hearing about all the great deals on filet mignon, gourmet hot dogs and scalloped potatoes. We received them as a gift from Mom and Dad once, and they were excellent – I’ve sent them as a gift once or twice, too. I also seem to hear from 1-800-FLOWERS a good bit – they do nice work, actually – once, when I sent my sister flowers under her maiden name (eight years after she got married - oops), they were able to fix it immediately, thus preventing an incident of any kind. Plus, the flowers are gorgeous. I sent Laura sunflowers (the state flower of KS) when H-Dog was born, and word on the street (via Mom) was that they still looked good several weeks out. In fact, this year, I’ve sent a ton of flowers, all to hospitals (babies, broken hips, open heart surgery). I should send myself some flowers to the office – I deserve them! Based on this, you might think I’m a generous gift giver – and I can be – but the nice thing about ordering online is that it saves the bacon of those of us who are forgetful, or, dare I say, disorganized. Moi, désorganisé? Jamais! Quel horreur! On that note, I’m making a commitment to better manage my time and organize my space. Let’s see if it works! I bought a few books over the weekend, and I’m following rules, even if they seem counterintuitive. Hell, if I knew what I was doing, I wouldn't need a book, now would I? Best piece of advice so far - "Be as clever about getting your work done as you have been about putting it off." So first, I’ll get on the ball at the office, next stop – the house! We have six weeks til Thanksgiving! Yikes! 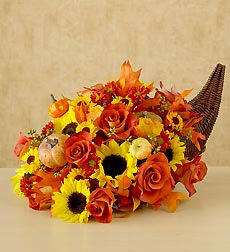 Ooh – check out the Thanksgiving flowers!